Goodbyes are always hard! I've done a lot of thinking over the past few months and while stitching on this quilt and have decided to take a break from blogging. After much thought and going back and forth as to what I should do, the time has come to make a final decision. I've found I've been spending too much energy and thought tending to the shop and blog when I really wish to be spending my time in other ways. I'm sure to continue all the crafts and hobbies that I love... sewing, quilting and hand stitching are what I'm really enjoying right now and will always be a part of my life. Keeping a blog has been so much fun for me. It's provided a way for me to connect with others while I've been at home caring for my children. Now that they are growing older, those nap times that I used to sew and quilt are not happening. I'd like to thank all of you for your kind comments, friendship and encouragement throughout the years! It's been a blessing to have so many people admire what I've made... that's really motivated me to keep going, finish up a project and to create and design some new things. Thank you so much! I'm having a big sale in the shop to help clear out all the remaining listings. Use the coupon code GOODBYE for 45% off your purchase. There are lots of pincushion kits, flag buntings and a few vintage sheet items left! the squares are cut at 3" and finish at 2.5"
...and I think that's it! You can continue to reach me through email at twinfibers (at) gmail (dot) com and on Pinterest... oh, how I love to find great stuff on there! I totally understand. I've really enjoyed your blog. Best wishes and I hope to see you pop up every once in awhile. I've thoroughly enjoyed your blog. A shame but I can see where you are coming from. Good luck. Totally understandable. I have enjoyed reading your blog over the past several months and wish you the best. Jessica - I will miss your blog. All the best! I'm so sad, but I completely understand!! Your blog was one of the first ones I started reading...thank you for sharing with us!! I so get it Jessica! I have loved visiting your blog and taking peeks into your world! Oh Man! I am so sorry to hear you will not be blogging any longer. Your blog has been one of my favorites. I enjoy seeing your projects. I am hoping that perhaps you will keep blogging on a more ad hoc basis so as to not feel pressure and be able to enjoy the process. Of course, this is a greedy hope. Regardless, best wishes! You do really beautiful and inspiring work! Beautiful quilt!! I totally understand you need to move on. Best wishes for all your future projects!! Understandable, but you will be missed! I've been dealing with similar issues lately myself, having to cut back on sewing and blogging time. Your blog was one of the first I found when I started sewing, and I've loved seeing your projects. Good luck in wherever you go from here! I sure will miss you!! Have fun in all of your future endeavors and enjoy life to the fullest!!! So sad for us but I TOTALLY understand! I stopped bloggin in January hoping to spend less time on the computer and more time actually quilting/sewing! The computer still has a gravitational pull. I hope you are more successful at breaking that bond and doing more of what you want to be doing! Thanks for all of your inspiration. Jessica, it has been lovely getting to know you and be inspired by you through your blog. Sorry to see this blog coming to a close, but I'm sure our paths will cross on Pinterest or flickr or somewhere. Keep up the hobby! Its good for the soul! I have been a big fan of yours for a long, long time! However, I completely understand. You will be missed! I am so glad I got to meet you! 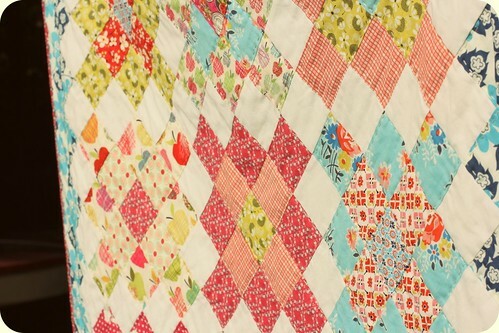 Thanks for blogging all this time and enriching my experience as a quilter. It's been both a pleasure and an inspiration to read your posts and see your quilts. 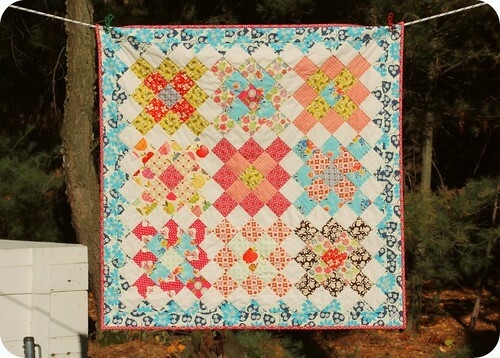 Thank you for your wonderful blog posts and yummy eye candy/quilts. Enjoy yourself! We'll miss you! Lovely quilt! So sad to see you go. I have really enjoyed your blog. Best wishes to you! Thank you for all of your wonderful inspirational quilts and crafty works. It have enjoyed stopping by here often and hope your enjoy a very much deserved break. Enjoy! It's a lovely quilt. I wish you luck in your next stage of life. yay for you and so sad for us. Lots of love to you and your family. I've been thinking about it a lot lately. Good for you for going with your gut. Thank you for the time we had! Best of luck on your new endeavors! Good for you for listening to your heart! I've so enjoyed seeing your work and will miss you! oh I'm sorry to hear this, but of course wish you the best! I can understand your thoughts, I think many people feel this way. I hope to see some new creatins nevertheless. Keep on crafting. Blessings to you on this new chapter in your life. You've made a difficult decision, but are following your heart and that's always the right thing. I've enjoyed your blog and inspiration! My best to you and your family. Oh Jessica, I am sad to see you go. I completely understand where you are in life. I am there myself and between working full time, being a mom, my creative times have become few and far between. I wish you the best of luck and hope that you would occasionally share some wonderful inspiration with us. Being Mommy is first and I truly understand this now more that ever. Best Wishes! Bye! Thanks for everything. I really enjoyed your blog. you will be missed. i hope you leave your blog up so we can read the archives. good luck in the future. We all have different seasons in our lives and you are in a new one and you have to do what is right for you. I enjoyed your blog very much. Your creations are beautiful. Best Wishes! I'll miss your blogging but I fully support anyone's notion to spend less time online and more time in life. I'll be sad not to read your posts anymore! Hopefully you will still keep the blog up - I always go to yours first and then look at all your links on the side. Your blog is what got me into reading other quilting and crafting blogs. Before I d=found yours I didn't even know so many wonderful sites existed! Enjoy your time crafting! I'm so sad to see you're leaving the blogging world. Your blog is one of my favorites. I will miss you, but all the best. Oh....I am going to miss your blog so much! You have been my sewing companion for quite awhile! But, I know how life gets in the way.... Wishing you all the best! Will you please post a link to your Blog at The Quilting Community? Our members will love it! 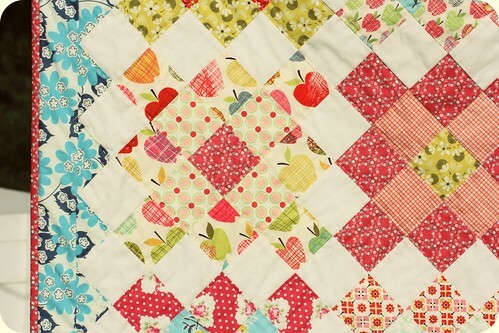 Members include: Quilters, Quilting Enthusiasts, Experts, Bees, Circles and Clubs. It's easy to do, just cut and paste the link and it automatically links back to your website. You can also share Photos, Videos and Articles if you like. Jessica-I've enjoyed your blog, and better yet, getting to hang out a bit at Summit last year. I hope all the best for you and your family. Enjoy! 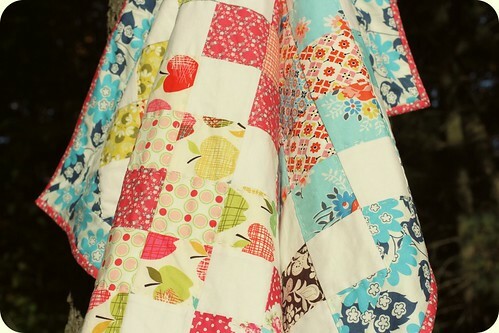 Your quilt is so beautiful (I love those apples), hope you'll have some time to quilt and blog in future! Good for you--what a wonderful last quilt to leave us with. Best ofl uck to you, Jessica!! I have LOVED your blog and am sorry to see it go away. sniff, sniff. I completely understand though - good luck to you and your family! Jessica, I might be one of your older readers. I have really enjoyed your thoughts on one of my loves, crafting. I know the decision to rearrange your priorities seems hard, but you will never regret it. You never get these years or special times with your kids back. I enjoyed your blog because I am in the empty nest years (3 college age sons) and am finding the time to be re-inspired. Thanks for you beautiful projects. Well, I can't blame you for wanting more time. Life is fleeting! I still plan to make one of your quilts, so hopefully I can still find you on Flickr. You'll be missed but I totally get it. I just came back from a two month break of not posting and not reading. It does take a lot of energy but no one should blog out of a sense of obligation, especially if they want to be doing other things. Take care and best of luck in the future! Take care and enjoy your break from blogging. So sorry to hear this but I completely understand as I have two children that are keep me hopping. I have gone back and forth about this very issue myself. I will miss drooling over your beautiful work. SO much eye candy. I have the pot holders that I won through your blog hanging near my sink. I rarely use them because I just like to admire them. I use them in photos for my blogs- Lori's Lipsmacking Goodness. mucha suerte en esta nueva etapa!!!!! We do understand your sentiments. You will be missed. This last quilt of your will be cherished and its a memorable one. Selfishly I want you to stay, but totally completely understand why you are choosing to go. You'll be missed, that's for sure. Sorry you will not be here anymore. I always loved looking at your blog. Yours was one of the first ones I found when I started looking at blog land. I absolutely love your quilt. 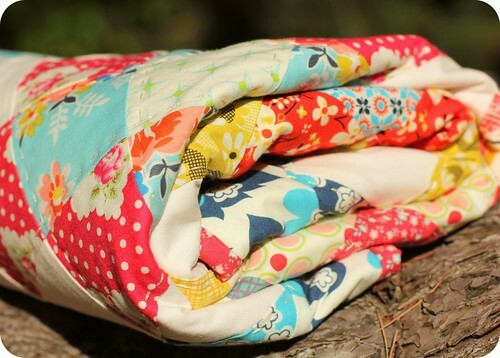 Would you share some of the fabrics you used to make this quilt. I would like to make one too. I just got to this post Jessica! And if you ever want to make a pattern of mine, just holler! Seriously! I really miss you blog. I still come back to it to see some of the beautiful quilts and things you have made and wish I could see more.